Plumbing industry manufacturers, dealers and consumers: they’re not on the same page. The recession and subsequent recovery has wreaked a bit of havoc on the recovering plumbing fixtures landscape. And now, plumbing manufacturers, dealers and consumers often find themselves operating from three separate camps. 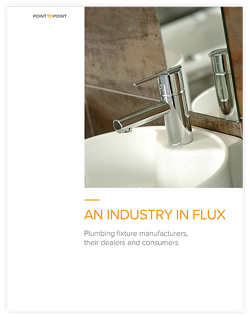 The industry in flux led us to reexamine the integral relationship between plumbing fixture manufacturers and their dealers. We conducted in-depth interviews with dealers across the U.S. to understand why they prefer one manufacturer over another, what drives product recommendations, manufacturer weaknesses and the state of dealers' business. This whitepaper details our research findings and outlines opportunities to strengthen these relationships with a coordinated strategy, designed to build trust and bolster the value of each plumbing segment. Fill out this form to receive our free plumbing industry whitepaper now.